Vesper is going to cost a whole lot more - for a whole lot more. Announced earlier on Daringfireball. Q Branch are raising the price to what they say is a realistic level and as a statement to other developers towards the real cost of developing software on iOS. 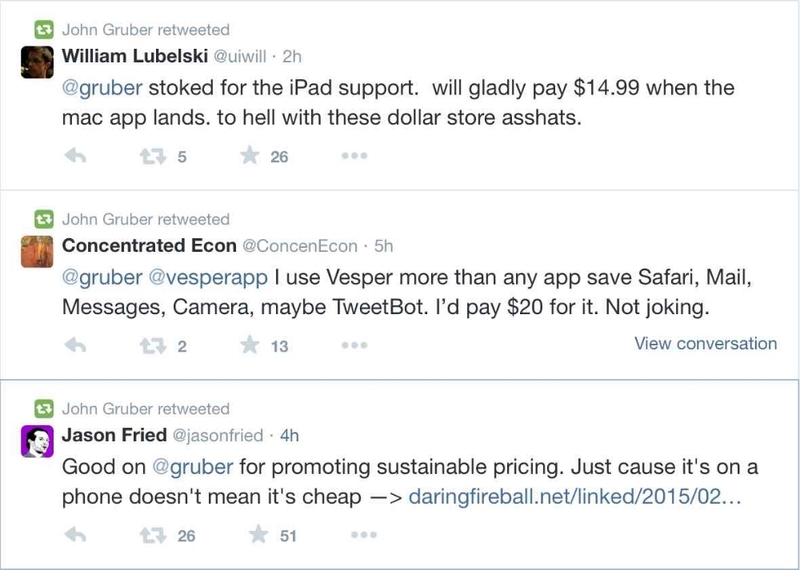 If Vesper pricing could motivate other devs to raise prices to a sustainable value then good luck to them. I want more quality titles on the app store instead of the free crap that incorporate in-app purchases. If those developing Vesper also have other well paying jobs then that's great as they didn't have to draw the line in the first place, they don't need to allow their other jobs subsidise the making of Vesper. Who better to take this position? Those dwelling in the Safari-extension-enabled, unofficial comments section on daringfireball would disagree. But public twitter comments share a sentiment that justifies the stance that Q Branch is taking. Let's see what happens.